Riding a bus had become foreign to me. As foreign as waking up to noiseless mornings that could put nights to shame with their stark absence of light. Since migrating to Canada seven years ago, I had let myself happily slide into the snug comfort of a personal car to get around. One winter morning, that ceased to be the case. In the middle of December 2017, I found myself waiting for a public bus on a steel-grey dawn with mountains of stiff white snow all around me. A change in the work life of my husband, with whom I used to share a car to get to the workplace, had just shaken up my daily commute. This meant a not-so-minor adjustment, coming as it did during the country’s unforgiving, bordering on dangerous, winter. The bus stop nearest to our house was a good 8-minute walk, not the best idea in a period visited by frequent and violent snow squalls. The next best alternative was to leave early in the morning, an hour and a half before my usual schedule, so that my husband could give me a lift to the bus stop — the first of the two I needed to wait at — before proceeding to his place of work in a different city. Standing there in the pitch dark of a sunless morning, an arctic chill cutting through my skin like a hundred hypodermic needles, I wondered if I’d be able to bear the regimen for too long. My interest in the ethics of public transit, especially as it related to reducing carbon footprint, wouldn’t merely be put to test but seriously challenged as I became a daily bus passenger amid temperatures plummeting to -20C and below. At each of the two bus stops, I would have to wait anywhere between two-nine minutes. Then, after a half-hour bus trip, I would have to walk for another six minutes to reach my office from the bus stop closest to it. Enough time for a skin-numbing life lesson on the power of a single minute. Inside the bus, secrets waited. There was warmth and ease, and not only because of the controlled temperature settings. The first time the bus turned a right-hand corner instead of moving straight on the road that led to my workplace, I sighed in frustration. This easily meant a longer commute than I was used to. Within moments, we were deep inside the sprawling campus of a university. A new world — of gothic buildings nestled in woods, winding roads and sidewalks and a river bisecting the eastern part of the campus — kept extending before my eyes like a poetic dream. Even the heaps of snow that blanketed most of the landscape couldn’t mask the beauty and magnificence of it. Over the course of the long winter I would look forward to this — the most twisted — part of my commute the most. Tall trees across the campus, rendered nameless by their wintry bareness, framed the building structures with their filigreed branches. Looking at them I forgot clock-controlled time. For an instant, I would imagine what the place would look like in spring or summer. Yet, I was in no hurry for that visual to manifest. What lay before me sufficed, spectacularly. Immigrants are notorious creatures of existential comparison. Riding the public transit inevitably brought back for me memories of commuting to college in Delhi by DTC (Delhi Transport Corporation) buses, necessary yet dreaded. The three years of my undergraduate programme required me to board a crowded bus from Kalkaji to Netaji Nagar, always late and often tilted with the weight of the humans it carried. My experiences as a female passenger in those three years made me vow never to ride a DTC bus once I had a job. I kept this promise to myself. From day one of earning a salary, I switched to Delhi’s ubiquitous paid personal transport — the autorickshaw. This was and felt like, a luxury, considering my paltry income. It also increased my respect for my mother, who had to rely on DTC buses for the entirety of her working life, travelling from south Delhi to North Campus. In Delhi’s hyper materialist environment, anything that cost you more indicated your ascension on the status-symbol ladder. 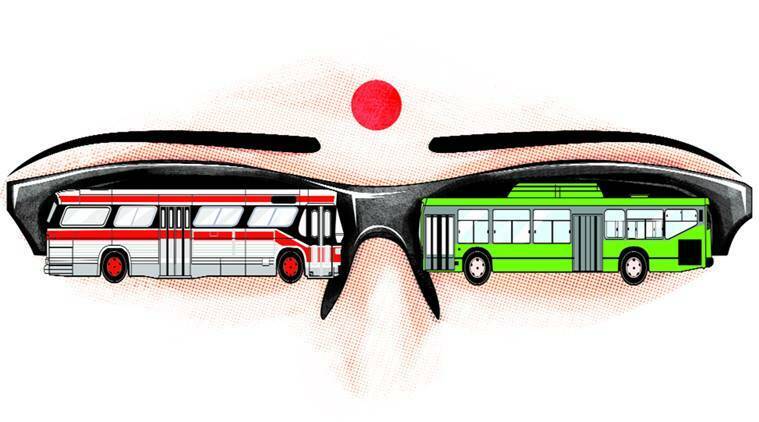 If you could afford an auto, you would never look back at a DTC bus again. Two decades later, as I ride the public transit at the other end of the world, the democracy of the act intrigues me. Beyond the obvious inclusiveness of wheelchair and infant stroller access, the bus here is what the suit-and-tie executive rides alongside the homeless bum with his overflowing cart of broken belongings. Its egalitarianism has liberated me from any stigma I might have been carrying for the public bus in my subconscious. Some of the closest friendships my mother enjoyed were forged in the public bus. As an introvert, I listened with envy to her stories of the in-bus sisterhood of working women. They shared everything, from in-law problems to kids’ issues, health worries and edible treats. Not having inherited her propensity for bonding with strangers, I have found books to be my most trusted bus buddies. Reading a book inside a moving bus is exhilarating. From Delhi to eastern India to rural China, the geographies I have traversed through the pages of the books I read seemed to take on a more active, pulsating life with the bus’s jerks and swerves. As I read, the distractions around me — the university students’ banter, the bus driver’s announcements, the view outside the window — taught me how the world of a daily passenger is both solitary and communal. The silent alliances formed are no less real than verbal ones. There’s reassurance in the mere act of travelling together, even if you don’t exchange a single word. The daily bus route to my office, curiously numbered 13, didn’t merely help me survive the Canadian winter on an unyielding snow belt; it took me to a spot — aesthetic and emotional — where I ended up writing a poem on this journey. As I would discover, the public bus has its own community of poets and artists. Poetry on Buses is an initiative that encourages daily commuters in King County in Washington, the US, to write poems on their experiences on the bus and other modes of public transit. Their poems are then displayed on the local transit systems. In 2016, the project invited poems on the theme, “Your Body is Water.” The obvious comparison between water and public transport reminded me of own poem in which I imagine the streets on which the bus runs as a meandering river. In London, Ontario, where I live, a woman artist drew a series of sketches depicting life in the bus. She went on to post her illustrations at bus shelters around the city as a gesture of her appreciation for this mode of transport and its role in engendering a spirit of community. The public bus is no longer foreign to me. It’s a mobile inn where I rest and recharge myself before the world appropriates my limbs and spirit. It was going along very nicely till it came to a somewhat abrupt stop (if “and its role in engendering a spirit of community” is indeed the last sentence; had to use a roundabout way to access this site as the gatekeepers of content in this land of the pure refuse to grow up).